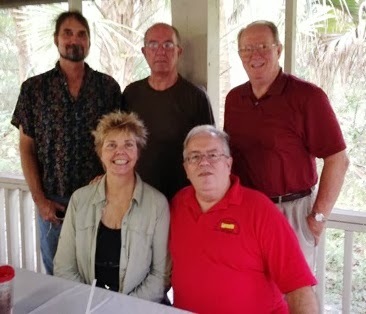 WIMAUMA -- A small but devoted band of cousins gathered together for food and family connecting on Veteran's Day 2013 at Little Manatee River State Park, with thanks to the organizing efforts of Tom Santa Cruz for reserving the screened shelter complete with electricity for plugging in and comparing family trees. Partners, spouses and children added to the gathering, although a bigger turnout would have added to the event. Sanchez (descendant) cousins include, standing, Bo Haven, Rick Sheffield, Ed Whitehouse; seated, Dee Graham, Tom Santa Cruz. Not pictured, Nickie Rucker.